Boxcar No. 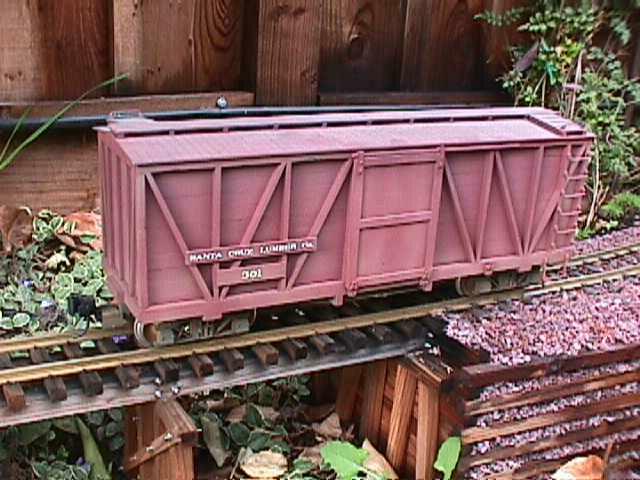 301 was the first piece of rolling stock aquired by the SCLCo. Built from scratch in the company's own shops from plans found in Garden Railways magazine, it first saw service in May of 1926. Dwight Ennis, the CEO of the SCLCo, envisioning grand schemes for connections with other common carriers (and the dollar signs that went with such connections), insisted that the Maintenance Foreman, one Benson Ennis, and nephew to the CEO, come up with a "standardized company numbering scheme for its rolling stock" which he could sign off on (whereupon, after relaying his instructions, he then promply left to take his afternoon nap like any man of great importance). The Foreman, sensing an exercise in futility, did his best to ignore the "request" of his boss, but the old man was insistant, harrassing poor Benson daily for weeks on end. 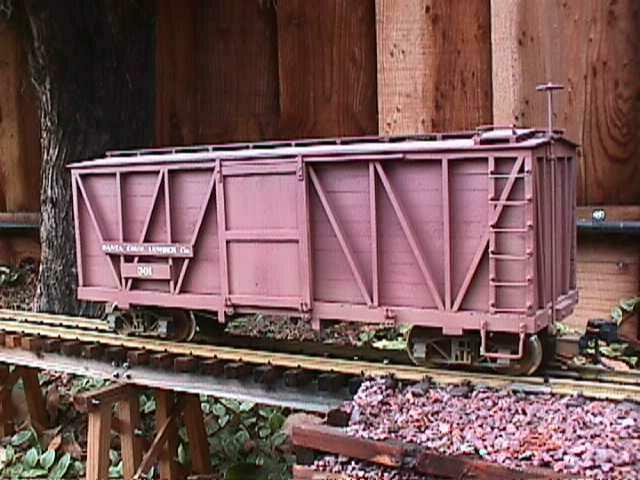 As the new boxcar neared completion, Benson finally caved in, and came up with a scheme in which locomotives and cabooses would simply be designated with the number of the order in which they were aquired. Flat cars would be numbered 201-299, boxcars 301-399, gondolas 401-450, with hoppers and ballast cars taking the remaining 451-499, and tank cars bringing up the rear with 501-599. Remaining numbers were "left open to be used as the need arises." Log cars were left unnumbered, "since the likelihood of these leaving the home rails is remote at best." This scheme pleased the old man mightily, and he dreamed in his vanity about SCLCo's hundreds of pieces of rolling stock criss-crossing the country. Predictably, the dreams of economic world conquest never materialized, nor did the common carrier connections (nor, for that matter, did the "hundreds" of pieces of rolling stock). Nevertheless, as the railroad's first boxcar, No. 301 proudly sported her designation to the end of her days. No. 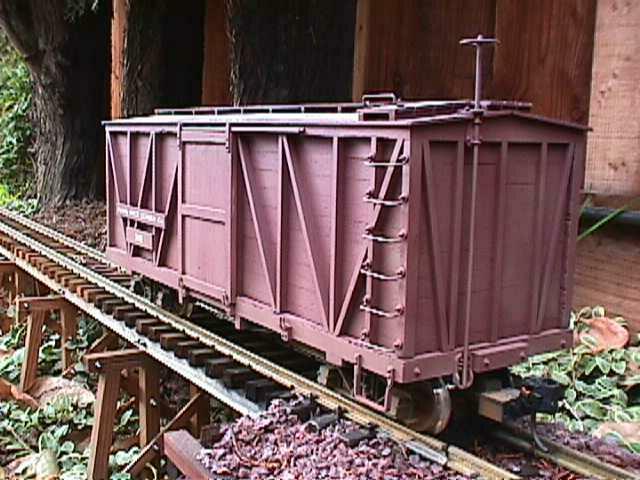 301 is an outside-breced boxcar built almost entirely of wood. Trucks are LGB, with all other fittings from Ozark. Door hangers are scratchbuilt, while bottom door guides are Ozark. A view from the "B" end. No. 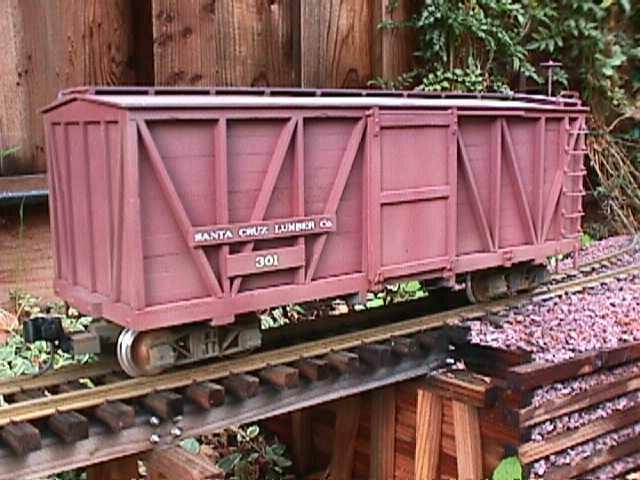 301 is mostly used to haul supplies and machinery parts to the logging camps.